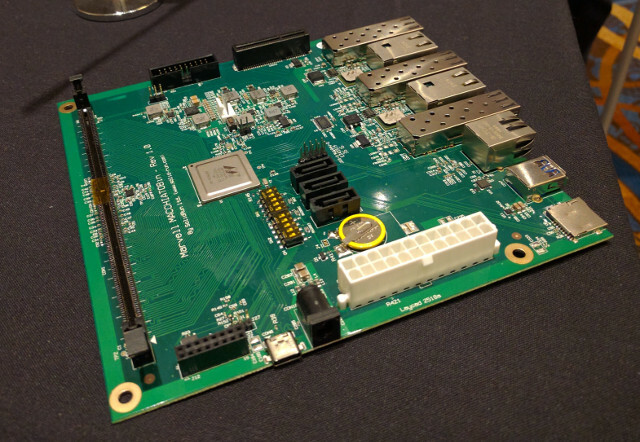 We’ve already seen SolidRun is working on a Marvell ARMADA 8040 quad core Cortex A72 community board for networking and storage applications, but based on a picture taken at Linaro Connect, the company is also working on a similar board with extra connectivity options called MACCHIATOBin. That board is said to be SBSA compliant, meaning any ARM SBSA server distributions (like Red Hat) should work with mainlined kernel and bootloaders (U-Boot and UEFI). The price is said to be $350 with 4GB RAM, exactly what the community board is supposed to sell for, so MACCHIATOBin could also be the latest revision of the community board with a layout change, and most of the same features. This is going to be expensive, that’s for sure. Strange board layout, especially the location of the DC power connector if this is supposed to be a mini ITX board. However, why doesn’t it have some eMMC onboard for the OS? Micro SD cards simply aren’t good enough for something I’m guessing will cost north of $500. It is written “Dimensions – Mini-ITX form factor”. Even the ESPRESSObin supports 6 different boot modes (SATA included) so maybe booting directly from SATA works already or just u-boot has to remain on SD card? Based on the blog post linked to, the price should be $350 with 4GB RAM, the same as the community board. So actually, it could even be the final version of the community board. There’s a good chance this is the 8040 community board. I sincerely doubt SolidRun would have two different mITX boards all of a sudden, given the original CB is scheduled for early access this month. You mean stuff like that? IPSec throughput utilizing OpenDataPlane? Or which ‘real benchmarks’ are you referring to? Well, the form factor is obviously the same as mini-ITX and the screw holes are in the right place, but no-one in their right mind would put a barrel type DC power connector for a power brick in the location they put it. Hence why I disagree that this is a “true” mini-ITX board. I don’t know of a single case that would accommodate that. Sure, you can use a standard ATX power supply, but it seems like a bit of a waste on a board like this which isn’t likely to draw more than 30-40W with the 10Gbit going at full speed. Also, why would you want to put the OS on a SATA drive? eMMC is much more convenient, as it’s there, on the board and with the prices today, it’s unbeatably cheap. @Kelly You can always add PCIe SATA controller and have more disks. @TLS Stop thinking about ARM/AArch64 boards like they would be yet-another-r-pi-toy. This board can be quite nice server for development or home NAS. Adding emmc to the board would bump price again or complicate it for no special reason. IMO this Macchiato thingie here is only interesting when you can make use of 10 GbE or want to explore ODP or ARM virtualization and stuff like that. I am not really interested in an x86 system. I currently have a tiny 2+1 disk NAS I built on an AMD x86 SoC because I couldn’t find any suitable non-x86 at a good price. If I am doing a replacement I want ARM or MIPS or PPC… whatever. Yup. It’s a general purpose board running general purpose OSs. Slot in a graphics card and, drivers willing, you could be running a desktop linux on it. Right now, it’s a perfect home NAS. Albeit, a bit expensive. @tkaiser You want to compare a 48-core Cavium to a 4-core Marvell? They’re not even remotely in the same league. @Kelly You can also use a sata port multiplier (that’s a cheap one, there are better ones). You would want to verify that the Armada works with multipliers (some SATA controllers do, some don’t). I had an ARMv7 linux notebook years ago, and it was my work portable. The only reason I’m not using one today is the brand got discontinued and the v7 is just too slow for productivity nowadays. So I’ve been experimenting with chromebooks and ubuntu tablets for portability purposes lately. Unfortunately the desktop ARM has been entirely missing ($1K+ server boards not counting). Here’s to hoping the CB is an early bird of a solid trend. You want to compare a 48-core Cavium to a 4-core Marvell? Phones with dvfs are getting hot and batteries are catching fire. Highend game console are refreshing early. Many have broadband not 4K able. But good news smart tv box sales are up. I suggest the home media TV boxes is the next up. Arm has chased phone and tablet sales to keep out intel. However markets are changing. But I can chime re ARM – they didn’t keep anybody out of mobile – Intel kept themselves out of the segment by assuming subsidies could substitute good products. They were proven wrong by the market. I was high lighting the markets for products are going through change faster. Samsung are hardly amatures at hardware design and build or resource short but even they have heat problems. You mentioned desktop Arm, blu. That is why I commented as I suggest to you the next Arm market up will be home media TV boxes, doing more than just films and tv. Desktop you have Remix OS and several more experimental OS , that or go Raspberry Pi etc. Intel did not want cheap low power consumming chips killing the golden goose high price server chips, is just my guess. It’s simply on the print side of the board and you can’t see it. BTW, am I mistaken in assuming the originally-planned 96boards low-speed gpio is gone from the final MACCHIATOBin? It’s nowhere to be seen on the visible side. Oh, and one more question: any provisions for heatsinks? I’m used to improvising with heatsinks on my ARM devboards, but any little help from the board layout would be welcome. 96board low-speed gpio was removed in favor of eMMC (they share some of the pins). @blu considering the dedicated sata and pci-e ports\slot, I’m guessing you have little to no use for the usb3 port so you can pull the wattage you need off of that and still have enough to keep run a usb keyboard \ mouse in there. Pulling 5V out of the USB is more of a ‘last resort’ in my case. I’m eyeing the white 4-pin connector at 11 o’clock (j10?) for a possible ‘clean source’ of modest wattage. @rabeeh Thanks for confirming! I mailed SolidRun with that question right after posting that photo but got no answer. Have to check budget and go order. @blu Put this board into normal PC case, add PSU and you will have lot of options for +5V. It’s the standard 4 pin fan connector near the reset button and the JTAG connector. We need to update the pictures with more details on what’s there. 8GByte DIMMs are working; next step is 16GByte. @rabeeh more photos would be lovely. I know about just three pictures. One from me, one from Riku and one from Linaro Connect photographer. I believe the barrel-connector is meant as a convenience for developers, who do not connect peripherals that use a lot of current during development and testing. I think it will be possible to add a graphics card to the board and have the 3 S-ATA ports connected to either just 3 RAID configured drives (or even 3 external RAIDs). It could make a fairly good desktop computer, router, server or multi-purpose board. I expect it would be great as a node in a compile-farm as well. There are loads of possibilities. Remember that your small Cortex-M boards can be connected directly via I2C, SPI, U(S)ART or even GPIO-pins. If I could purchase the board without RAM, then I would, because it would make it possible to “split” the payment that way; I’d get the board more quickly and perhaps be able to use an old 2GB module until I could afford a 16GB module. Maybe not. The ESPRESSObin board is all of about $50US if they keep to plan. I expect this one running $200-300. Heh… Called it. 4GB of DDR4 configuration will set you back $350. You want 16Gb, it’ll set you back $550. You want performance? Doesn’t matter what arch you’re talking about? You’re going to be paying for it.